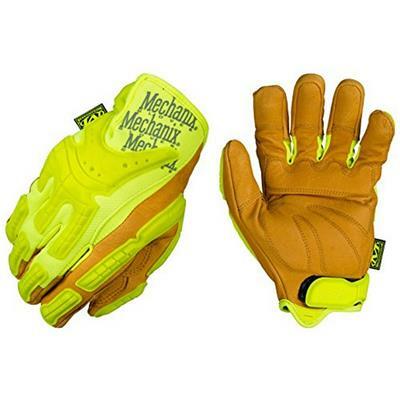 The Hi-Viz Heavy Duty work glove is your first line of defense against impact, abrasion and hand fatigue on the job. ANSI-107 compliant fluorescent materials make you more conspicuous in hazardous work environments and reflective ink provides eye-catching luminance. The palm features machine washable leather, multi-zone padding with XRD® performance cushioning and leather reinforced fingertips where you need it most. High-visibility Thermal Plastic Rubber (TPR) impact protection disperses damaging blows to the top of your hand and extends to the tip of each finger for critical pinch-point finger protection when operating heavy equipment. Features. ANSI-107 compliant fluorescent materials and reflective ink provide luminance. Full leather palm and dual layer fingertips provide extreme durability. XRD® performance cushioning reduces hand fatigue from shock and vibration. Full coverage impact and pinch-point fingertip protection. Low profile cuff provides full range of motion. Machine washable leather.